There is just way too much ball play in our home for normal people. We live in a small apartment, so I need to find good ways to let the boys release all their excess energy. To try and direct the ball throwing away from my authentic Tiffany lamp IKEA street finds I took one of the huge boxes that Kiddo will not let me get rid of and fashioned it into a carnival game. It’s super ugly, but it kept them busy for quite some time and directed their ball play in an effective way that didn’t cause too much chaos. It’s also good for math practice if you add scores to each cutout. Kiddo practiced his addition based on the scores we assigned to each opening. 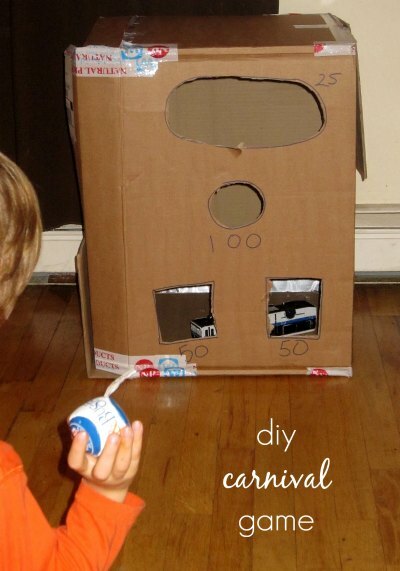 For more fun indoor play ideas visit our giant list of indoor activities for kids. This is a cute idea! Buses definitely like those openings too.